Washington and Manila kick off CARAT Philippines 2016. On June 6, the United States and the Philippines kicked off this year’s iteration of their annual CARAT military exercise. CARAT is part of a series of bilateral naval exercises conducted by the U.S. Navy with partners now involving nine countries in South and Southeast Asia – Bangladesh, Brunei, Cambodia, Indonesia, Malaysia, the Philippines, Singapore, Thailand, and Timor-Leste (See: “US Eyes Expanded Military Exercises with ASEAN Navies”). 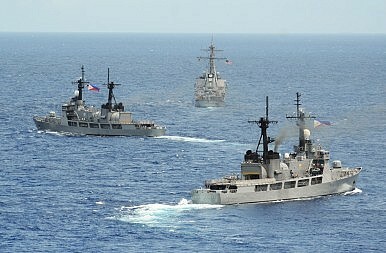 The Philippines, one of five U.S. treaty allies in the Asia-Pacific, has been part of the CARAT series since it began back in 1995. CARAT Philippines 2016, which involves the U.S. Navy and Marine Corps and the Armed Forces of the Philippines (AFP), officially began this week. It is taking place in multiple locations across the Philippines and in waters near Subic Bay and Palawan, running until June 10. According to a statement released by Task Force 73 – the U.S. Navy task force of the Seventh Fleet which coordinates exercises for Southeast Asia – this year’s CARAT Philippines will focus on combined operations at sea, amphibious landings, diving and salvage, maritime domain awareness, and community service events. Activities will include military engagements, professional exchanges, training seminars, as well as civic action projects and other cultural activities. On the U.S. side, assets and units will include the guided missile destroyer USS Stethem (DDG 63), the landing dock ship USS Ashland (LSD 48), and the diving and salvage ship USNS Salvor (T-ARS-52), along with a P-8 Poseidon aircraft. Meanwhile, Philippine Navy assets and units will include the Minesweeper Frigate BRP Rizal (PS74), the Del Pilar Class Frigate BRP Gregorio Del Pilar (PF-15), a Landing Craft Heavy vessel, and an AW109 helicopter. CARAT Philippines comes just after CARAT Malaysia, the first leg of the series which began on June 1. U.S. officials have described this CARAT exercise series as being the most complex to date. Additional bilateral phases of CARAT will occur through November this year. Pacific Partnership 2016 moves to Legazpi.